good reality article in the #Guardian today. #hyped up #masculinity where you can’t lose face - better to #die uh! I grew up in Lewisham, and anywhere where there’s poverty, and where you bunch up a large amount of people and social problems together, you are going to get crime. Youth violence is something that has been happening around me since I was a teenager. It’s not new and, where I’m from, it’s not just something that only exists on the TV news – it’s real. There’s a lack of options and opportunities, and it causes a lot of anger, a lot of rage, and people look for a way to release that. The lyrics to my new single, Run Run, are based on things I’ve experienced. One of those was seeing a gun for the first time, when I was 14, at a party. Two boys started arguing about the music being too loud, and it escalated, and one of them pulled out a gun – I remember being so petrified, everyone running and not really understanding what was happening. Me and my friends only ever spoke about it once after that, which is strange. But I think we were shell-shocked and didn’t want to contemplate what might have happened. Over time we became desensitised to being around that kind of violence. The boys at the party weren’t that bothered about it at all – we were made to feel like it wasn’t a big deal. I think boys in those environments live a completely different life; I can’t imagine feeling like I need to carry a knife with me when I go out, because somebody might attack me at any moment. Run Run is about being trapped in that world and not being able to escape. Who can you ask for help? You can’t go to a local youth centre because they have all been closed, you definitely can’t talk to the police; a lot of people feel like they are not going to give you any sort of protection if you ask for help, and you’ll be ostracised by your community. So you feel like there’s no way out. But I want to let young people know that, even though it’s a major struggle, they can escape that environment. I think it’s really important to focus on the mental health aspects of all this, particularly in the black community. We have a culture of not talking about feelings, a mentality of having to stay strong and get on with it. So many of these young boys have mental health issues and aren’t even aware of it. They don’t know why they act or feel the way they do. Better youth mental health services are vital. When you listen to drill music, a lot of the words are very powerful, very dark, and you can hear the pain in the music. As much as they are speaking about violent crimes and drug dealing, they are trying to speak the truth and using music as a form of catharsis. You are hearing a 14-year-old rapping about how his family don’t know where he is, because he’s in a trap house somewhere outside of London, sleeping on the floor with 10 crackheads. It’s so traumatic, it’s unimaginable. With the demonisation of drill music, it’s like nobody in power wants to take responsibility. The government doesn’t want to take responsibility for making the cuts, closing down youth centres, stopping after-school clubs and mental health services. 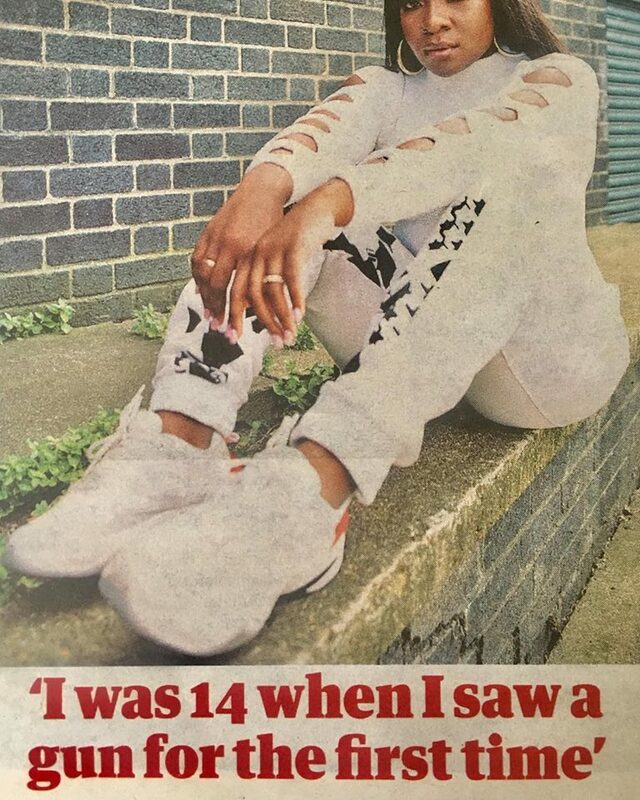 The media have a field day attacking the image of young black people. Investing money in creating spaces and support for young people shouldn’t be that hard. There is literally nowhere to hang out, apart from places that cost money. Investing money to put more police officers on the street needs to happen. And we need to look into educating people in schools from an even younger age; by 14, too many young boys are already carrying a knife. By that point, you have already lost some of them – it’s too late. So many of the people who are being stabbed are presented as savage animals, and these are children. It was very emotional being on set to shoot the Run Run video. Tears were shed. There’s a scene where I am up on the roof of an estate in Brixton and I was looking down at these surroundings, thinking about what was probably going on in the estate. It was very real. Everyone walked away that day after filming feeling heavy.I have a wide range of listeners, which makes me really proud, because I feel like this song is going to reach different ears. I have young listeners and I hope that when they hear this, they try to make a change, and try to figure out what they can do in their community to make a difference. And then I hope that people who this topic doesn’t affect personally can understand – these dead bodies on the streets of our cities aren’t just statistics. What can they do to help make a change? I’m just hoping mainly that it sparks conversations, and from those conversations people take action in whatever way they can.